Next to downtown Boulder, though much quieter and seemingly worlds away from the pace of downtown, is the neighborhood of Whittier. Another of Boulder’s first neighborhoods, Whittier has a quiet charm, massive trees and incredibly beautiful homes. 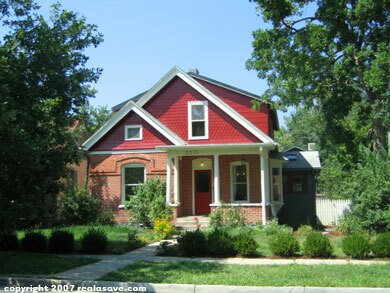 The Whittier neighborhood encompasses part of downtown Boulder and boasts numerous home styles including many historic and land marked homes. Whittier Elementary school is the oldest continuing operating school in the state. The neighborhood encompasses the residential sections of Boulder bordered by Bluff Street to the North, 28th Street to the East, Canyon Boulevard to the South, and Broadway to the West. Maintenance of the flower plantings at neighborhood bus stops. Properties in this area are well taken care of and much-loved by their owners, and these large, homes compliment the traffic-less streets. The fascinating architectural details in this area set it apart from newer Boulder neighborhoods; with slanted rooftops, curved windows, stone facades, arched shingles and contrasting trim colors. It’s a feel good neighborhood. Whittier echoes expense and luxury in a very down-to-earth manner. The neighborhood’s sumptuousness is reflected in its character. It feels like a close, family neighborhood where your kids could actually play in the street. The Pearl Street Mall and an amazing array of shopping and dining options are just minutes on foot from Whittier, but this neighborhood does have a few hot spots of its’ own. Great fine dining in the area at Johns Restaurant, Mateo and Fresca. Also if your looking for sandwiches Snarfs or Salvaggios both on Pearl St.
Visit Whittier and you will feel the quiet, the warmth and charm of this wonderful downtown neighborhood.